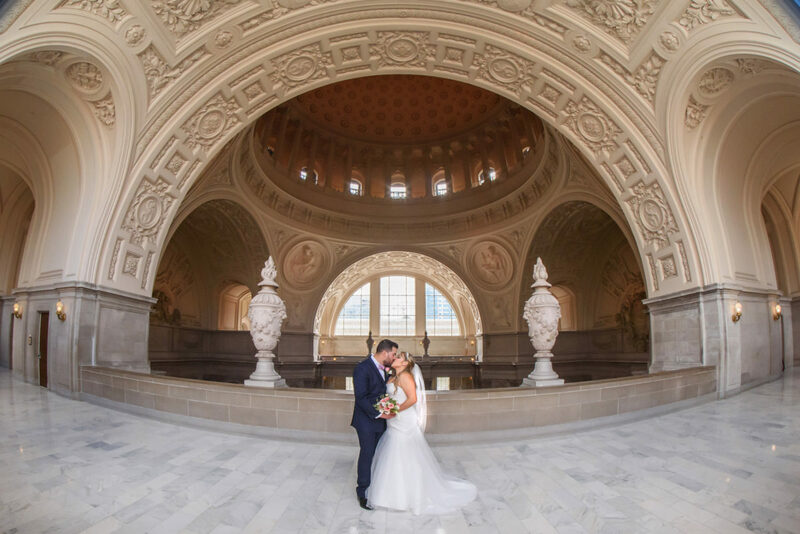 We spend a lot of time on this blog talking about all the reasons our clients should consider holding their nuptials at San Francisco city hall. I thought it would be interesting to present a different view point. A perspective that has nothing at all to do with the potential benefits and advantages of City Hall weddings to the general public. Instead today, I present a photographers view of the joys of shooting weddings here. Why do we like it and are there actually a few things that we dislike. 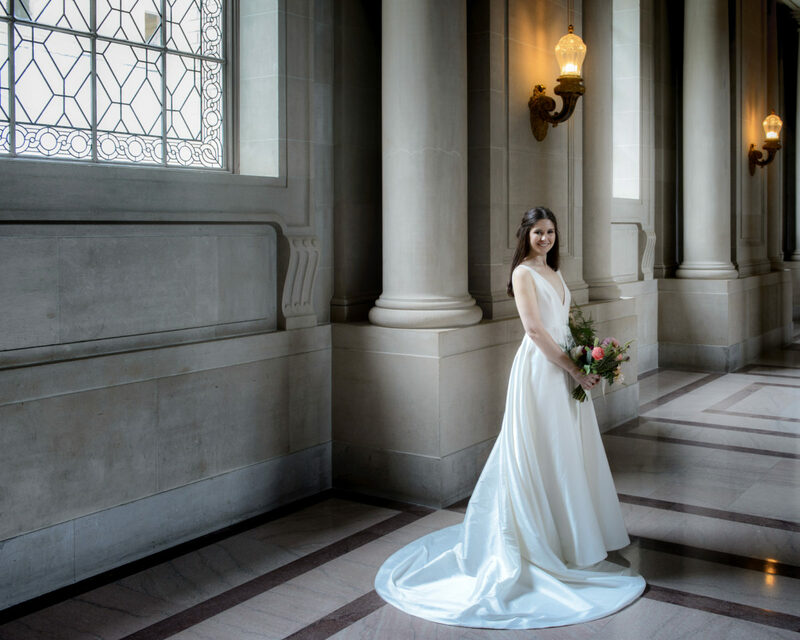 The first time I ever set foot in San Francisco city hall, I was greeted by multiple brides walking around. Understand that at this point I had already been a wedding photographer for many years. In my world, brides only existed on weekends or maybe an occasional Friday. Weekday brides? This can’t be, I thought! I investigated further and realized that yes, people DO get married during the week. Not just a few people but many, many people. 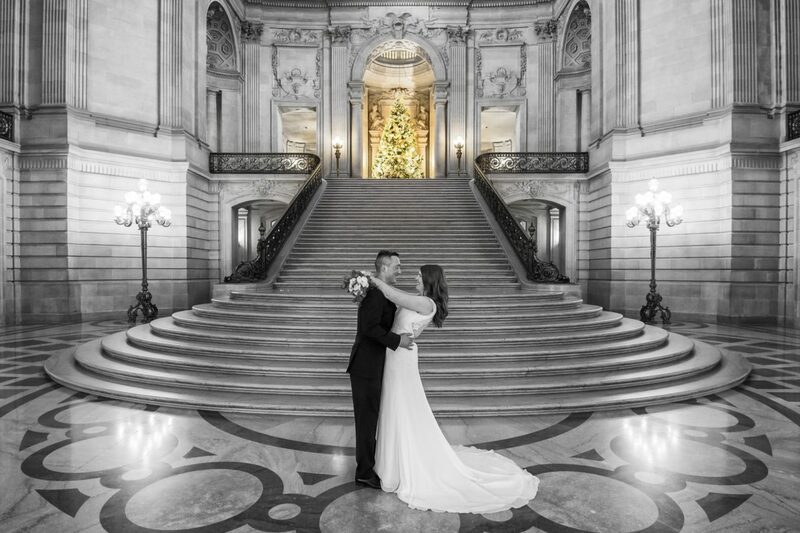 A further investigation revealed that, in fact, San Francisco city hall hosted approximately 35 weddings per day! A wedding photographer’s paradise! Before I get into what I did after making this amazing discovery, I think it is important to share a few quick words on Wedding Photography from a business owner’s perspective. In many ways, being in the wedding and event business is very rewarding and it can be lucrative if you have the right niche. However, anyone in the Wedding / Event business will tell you that once you become successful your weekends are mostly shot. Especially during the summer months. When my business was at it’s peak, I would sometimes go 6 or 7 weekends in a row without being able to do anything in the summer that didn’t involve pointing my camera at pretty brides. My wife was always having to make excuses for me and explaining to family members why I could not attend events and parties. “Mike has a wedding that weekend”. It didn’t take too long for me to figure out that I should try to explore the possibility of photographing more weddings at city hall and less big weddings on weekends. So before it was popular to do so, I made a City Hall Wedding Photography website and also added a City Hall section on my main website. I am not saying I was the first of many San Francisco wedding photographers to make these changes because I wasn’t. However, I certainly was among the first pioneers to specialize in weddings here. Many other wedding photographers have followed and now there are dozens that claim it as a specialty. Not so long after I made these changes, the weddings started to pour in and we found ourselves busier than ever. It didn’t take long for me to be able to cut back on my big weekend weddings and now I am happily one of the leading wedding photographers shooting weddings at this amazing venue. End of Part 1 – Part 2 coming tomorrow! 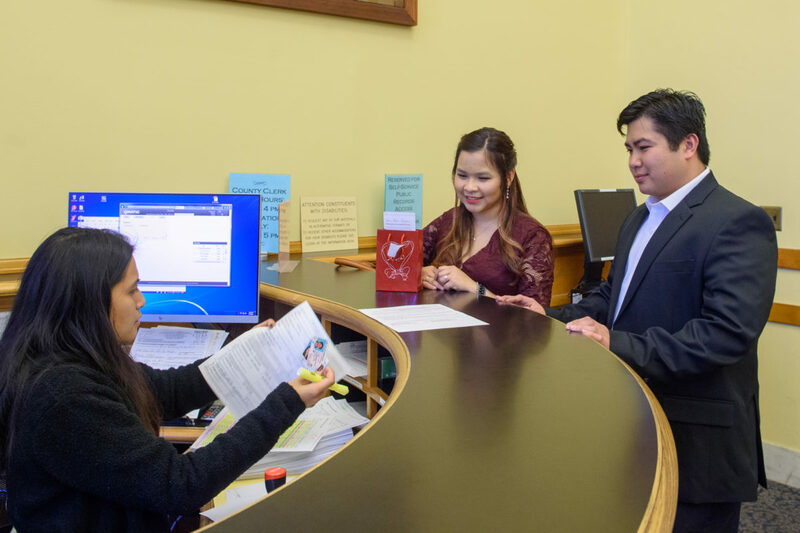 When checking in to San Francisco city hall for your civil ceremony, please remember to bring your current Identification and your marriage license. You will not be allowed to have your civil ceremony that day without these documents. 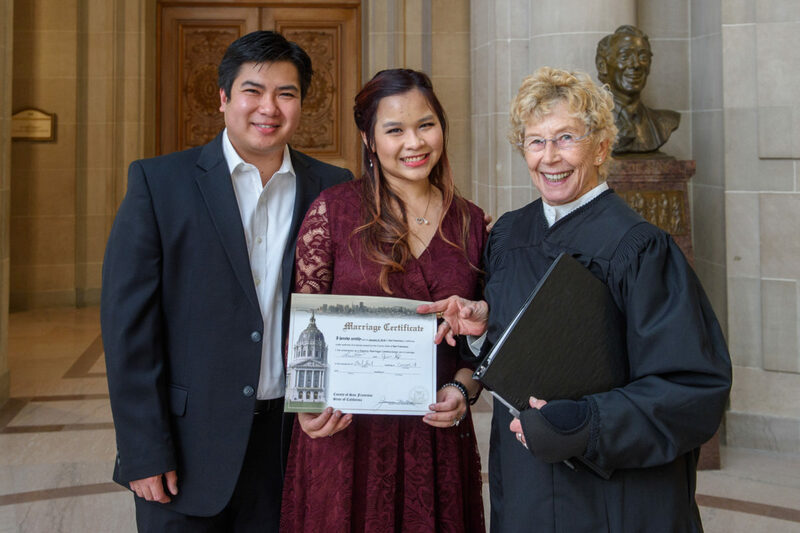 We strongly recommend obtaining your marriage license the day before your city hall ceremony rather than doing in on the same day. This will make your wedding day less stressful! This won’t be my typical blog post, but I just had to talk about this today. 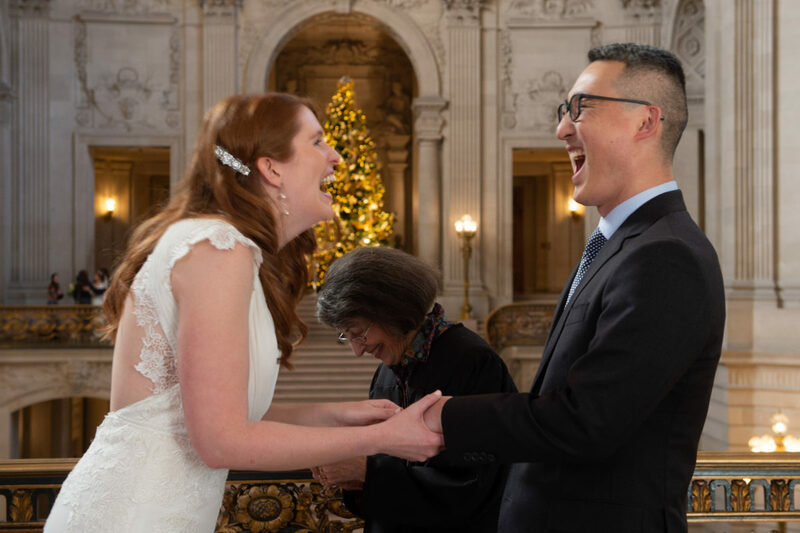 We had a quite a crazy day for our most recent San Francisco City Hall wedding, but our couple handled it amazingly well. This is the story of the day, March 11, 2019. It all started with an unusually long line at the County Clerk’s office for our soon to be married couple . What was normally about a 3 minute line was actually closer to 20 minutes. How did this happen? We are pretty sure it was mostly due to some bad timing coupled with the fact that the other doorway that handles Birth Certificates happened to be closed that morning. Anyway, we got in line to check-in and we waited. It was not that big of a deal at this point because everyone was in the same boat. No weddings were going to happen until brides and grooms were able get through that line. We casually talked about nothing special mostly, with a little bit of discussion about the upcoming shoot and how we were going to handle things. I also asked the couple if they had lunch plans so I could determine the amount of time I would have for wedding photography after the ceremony. Unfortunately, the couple DID have reservations and the place they wanted to go to was only able to hold their reserved time until around 2:30 to begin their party. 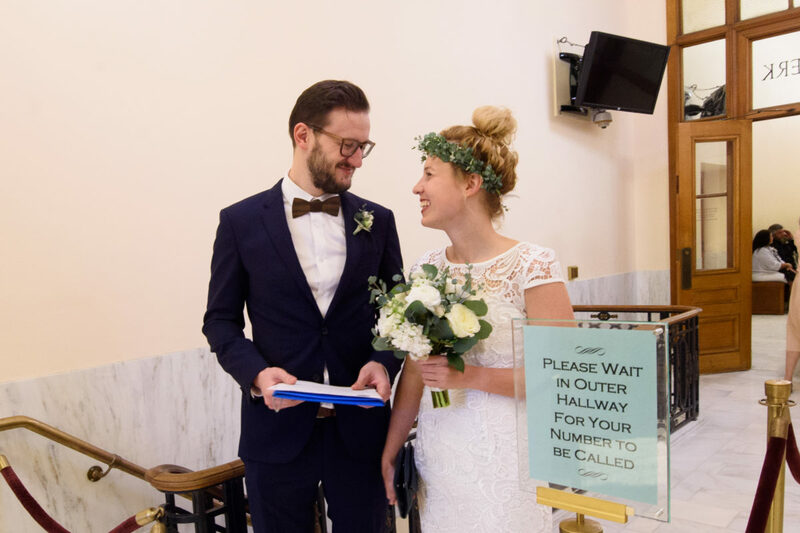 After waiting for all of that time the couple finally made it to the front of the line and were just about ready to be summoned in to meet with their marriage commissioner and then it happened….. The Fire Alarm sounded and we received the order to evacuate City Hall. The engaged couple were already about 20 minutes late and this delay would prove to be so much more. We spent a good 1 hour outside waiting to get cleared to return to the building once the Fire Department arrived and departed having determined that it was a faulty Smoke alarm that was at the route of the problem. Of course a certain city hall safety protocol had to be met before visitors were allowed back into the building. This included allowing the employees in first! After all of this waiting and worrying, the ending was happy. 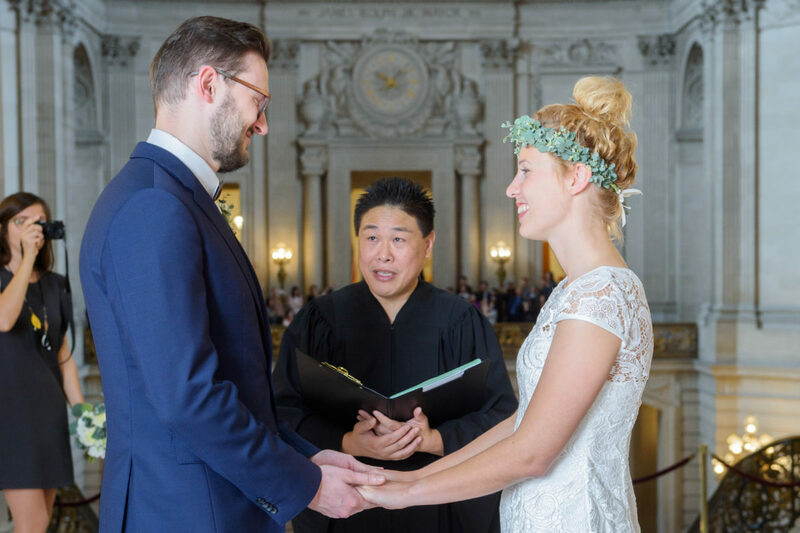 The couple not only had their San Francisco city hall wedding ceremony, but they made it to their lunch on time. The venue decided to stay open a little later just for them! Toni and I felt like we did a nice job keeping the couple calm and the family informed. We tried to turn a potentially stressful situation into a positive marriage experience. The newlyweds will probably look back on this day and smile! 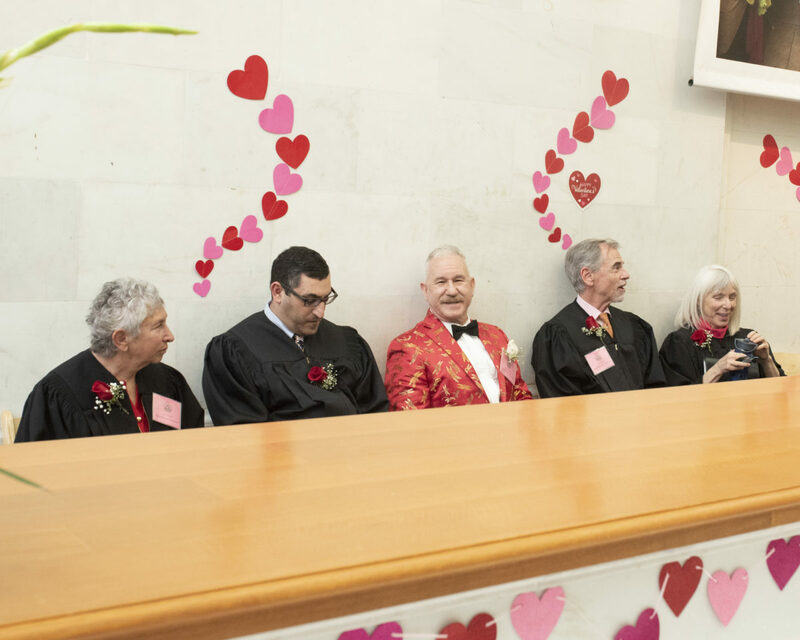 Another fun Valentine’s Day at San Francisco city hall! For those of you who are unfamiliar, city hall has been staging a celebration on Valentines Day the past few years. They allow walk-ins to get married at no cost! You might have to wait a while, but its all part of the fun. They set up a Photo Booth and bring in pretty much all of the Marriage Commissioners to deal with the overflow. 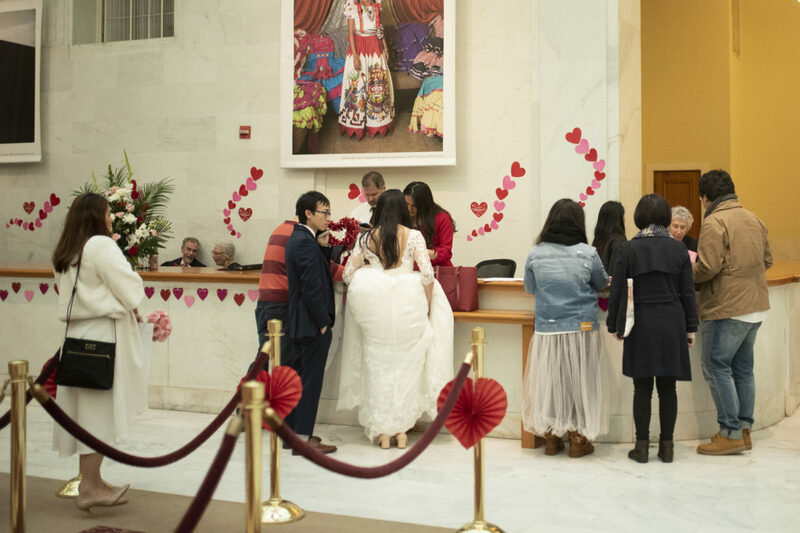 To further enhance your Valentines Day wedding experience the County Clerk’s office sets up cute, Valentine’s themed Backdrops for photo opportunities. I think this is particularly important because if you are getting married on this special day, it is appropriate to have some wedding pictures that will remind you of the day. 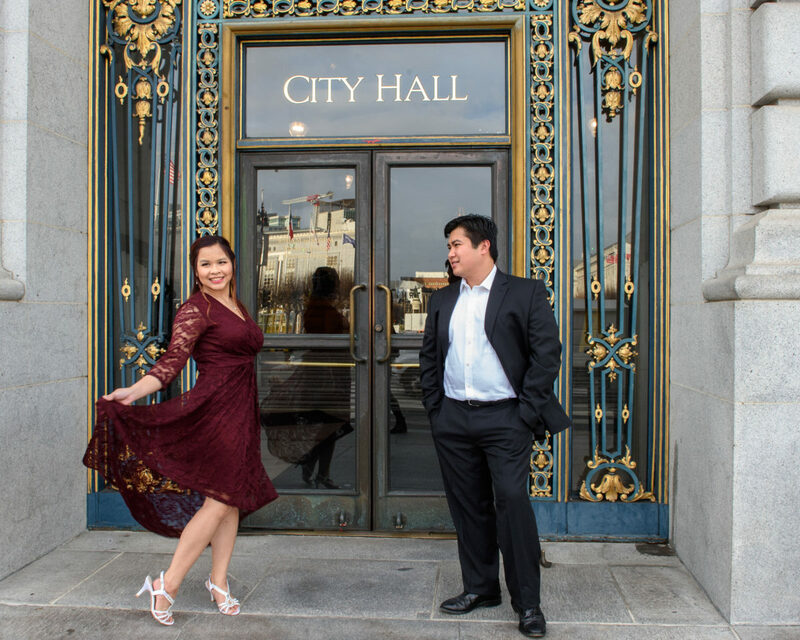 As San Francisco city hall wedding photographers, we would also photograph you around the building to take advantage of all that this destination has to offer. But I love the idea of getting a few shots in the giant Heart for example and in front of their many other decorations. The other thing I need to mention is just the overall mood present this day among all of the workers in the County Clerk’s office and the brides and grooms. A positive mood is created for all to enjoy and I always look forward to being involved in it. In fact, this year I didn’t even book a wedding, but showed up anyway to be involved and to get a few nice photos for this blog. 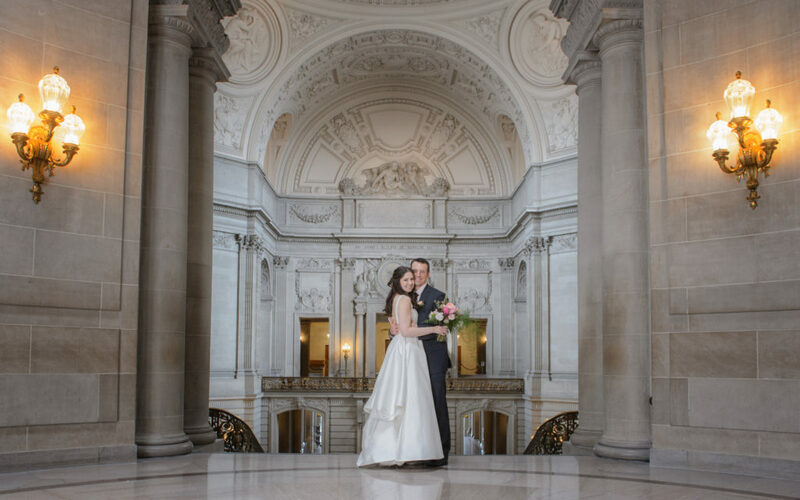 If you are a San Francisco City Hall Bride-to-Be, you want the perfect wedding. I have been involved in over 400 weddings at City Hall since 2012 and created this guide just for you. 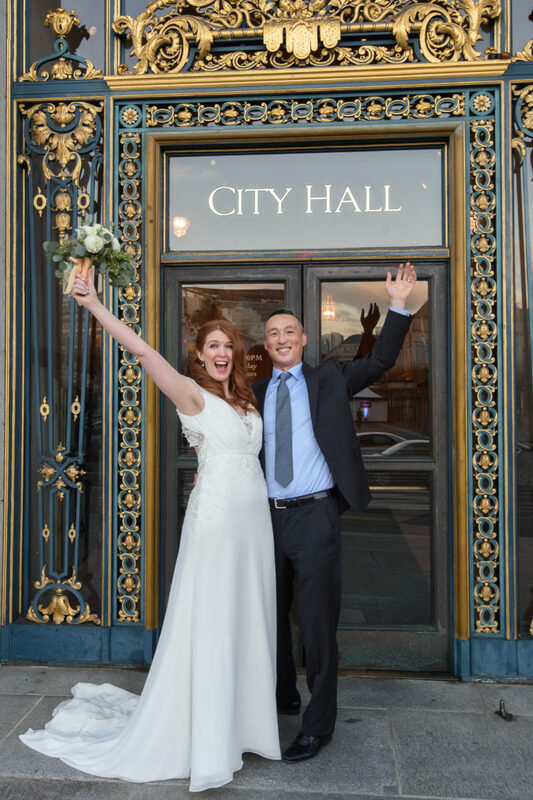 Idea # 1 – Treat your city hall wedding like you would any other wedding. City Hall is a formal venue. The elegance of this building lends itself to making your event fancy and at the same time fun. I can’t tell you how many times my city hall brides have been surprised when they enter the building and see so many formal dresses on others. 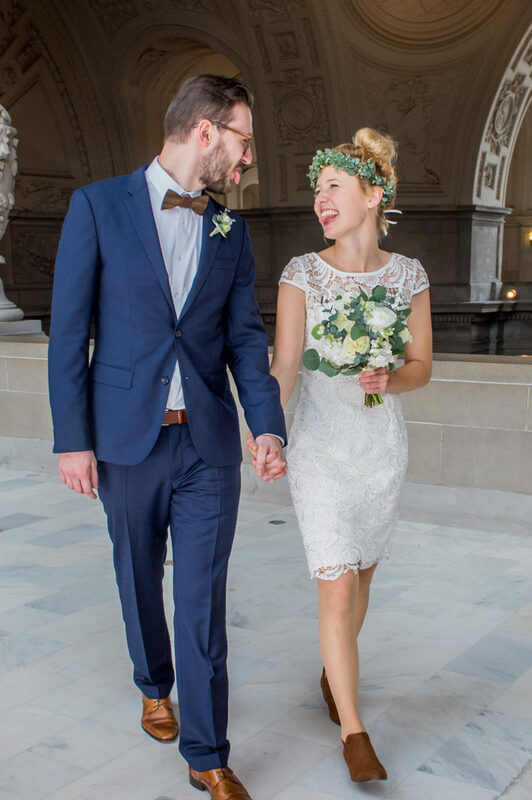 Many feel that since their San Francisco city hall wedding is a so called “Civil Ceremony” that people will be dressed more casually. They soon find that brides will often go all out with their dresses and the grooms will wear tuxes. It works here because of the high class atmosphere at city hall. The other thing that frequently is left out is Flowers. Many of our brides do not bring a bouquet for the same reasons. 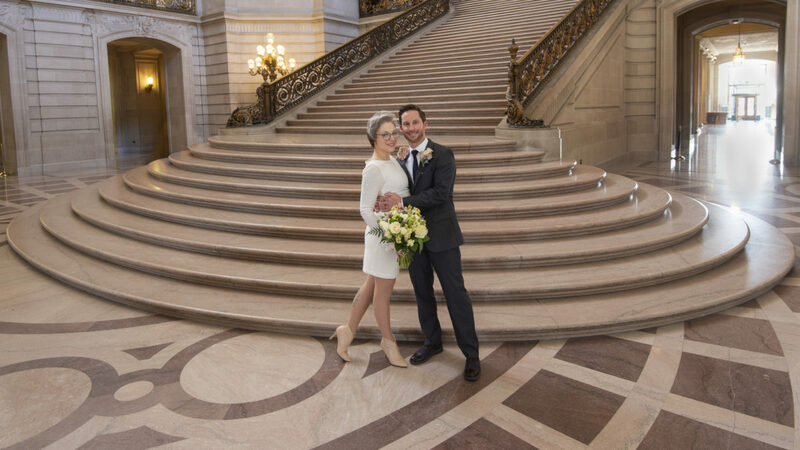 They think of SF City Hall weddings as informal, so no flowers are purchased. From a city hall wedding photographer’s standpoint, I highly recommend flowers be included. Despite the obvious beauty of the building, there is one minor issue…. There is no color in the background at city hall, so adding some flowers provides some nice contrast and focus. Idea #2 – Consider having a Reserved wedding at City Hall. For an extra $900 you can rent out either Mayor’s Balcony or the 4th Floor North Gallery and have a semi-private ceremony at San Francisco City Hall. The cost of $1,000 is actually a bargain in San Francisco for a wedding celebration. They can seat up to 60 people and you get a roped off private area to have your wedding for 1 hour. Idea #3 – Book your city hall wedding Reception at a nearby Restaurant. There are a number of great places to eat walking distance from San Francisco city hall. Save money on transportation and have your wedding celebration at any one of them. It will be more convenient for your guests and will save you dollars! Some examples include: Soluna Cafe, Corridor, Jardiniere and Absinthe, but there are many more! 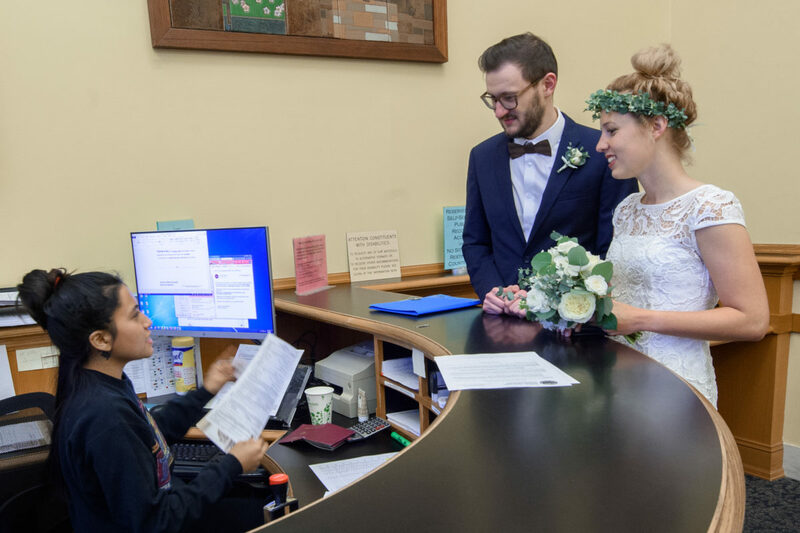 Idea #4 – Obtain your Marriage License the day before your city hall ceremony. Obviously it is much more convenient to process and receive your marriage license on the same day you have your civil ceremony and it normally works OK. However, as city hall wedding photographers we have witnesses many times where this procedure backfires on the engaged couple. One of the reasons relates to timing. If you don’t allow enough of it between the license processing and the actual wedding ceremony, you might end up feeling rushed. I believe a couple’s wedding day should be a celebration without too much time spent processing paperwork. The other issue that occasionally comes up are documentation problems. If you do not have the appropriate documents to process the license and your wedding is in 30 minutes, you have a big problem. However, if you do this the day before, it gives you a full day to fix any issues and it is one less thing to worry about on your wedding day. What do we mean by “Easy Wedding Photography” and how is it accomplished? Why even try to make it easy? Easy for who? Will wedding photography dominate our day? Are we going to have to do a lot of silly poses? Is the wedding photographer going to be difficult to deal with? Will we feel uncomfortable during the formal shoot? Will the wedding photographer listen to our concerns or suggestions? Notice that none of these VERY common questions have anything to do with the quality, quantity or cost of the wedding photos. Yes, you would think that our clients would be more concerned about those types of issues. After all, isn’t that the most important thing? We all want great photos and lots of them for a low price. Oddly enough, however, we receive a great many emails and calls asking questions that are more related to the how the shoot will go and what will be required. I recently almost lost a wedding booking because the groom decided that he didn’t want to go through with hiring a professional city hall wedding photographer because he thought it would make him feel uncomfortable to pose for pictures. After some reassurance that I would strive to make the photo shoot “easy” the couple went ahead and booked. So it is obvious that this is a valid concern among our clients. Who wants to have no fun on their wedding day? Who wants to spend the entire day taking wedding photos? With a few exceptions, the answer is nobody. 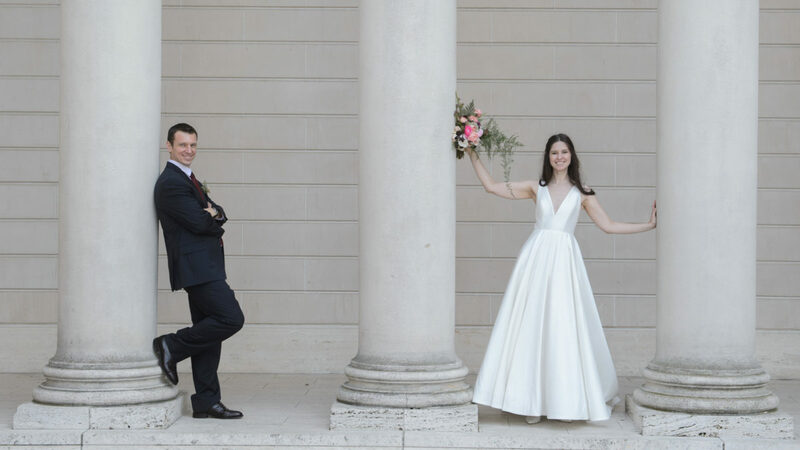 Most people want to have brilliant wedding photos with a small amount of fuss and time spent. Is this realistic? The answer really depends upon the expectation of the couple. Consistent with this same topic, many of our engaged couples let us know that they want mostly candid photos on their wedding day. 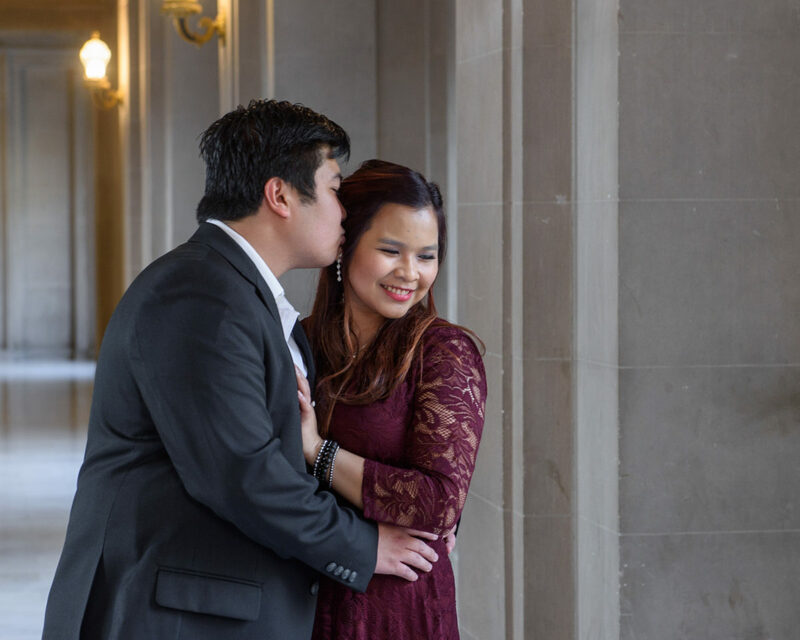 I always let them know that we are happy to provide them any type of photography coverage that they prefer, but I am also quick to point out that San Francisco City Hall weddings may not have as many candid moments as a typical wedding would have. There is no dancing, no cake cutting, no toasts and often times no guests. The candid moments need to be created by the wedding photographer in most cases. We do this by having the couple walk hand-in-hand through out the building and interact as though they were just touring the building. But obviously not all of the photos can be walking shots. We mix it up and try to put the newlyweds in other interactive situations. We even might sit them down on the Grand Staircase and just have them interact and talk. Some of our best images can be born out of these contrived situations. Keep the wedding photography easy and you will end up with great final images! 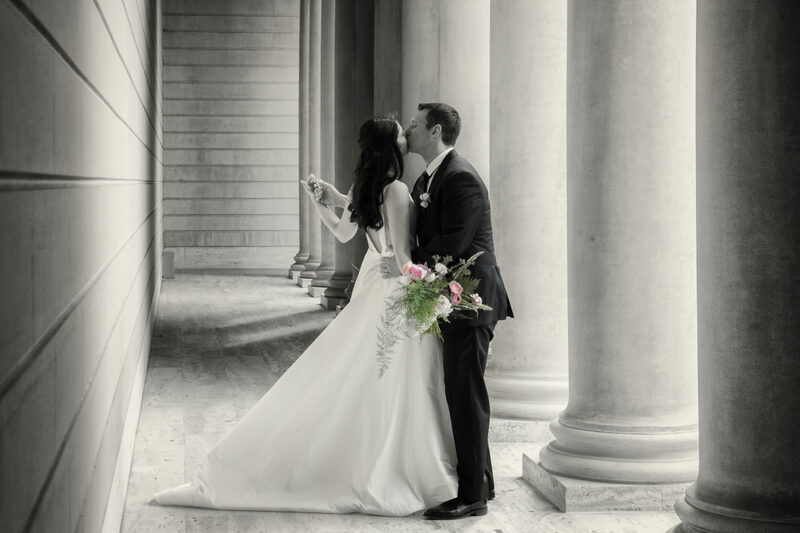 Often times there is more to photographing a San Francisco city hall wedding then just making nice pictures. 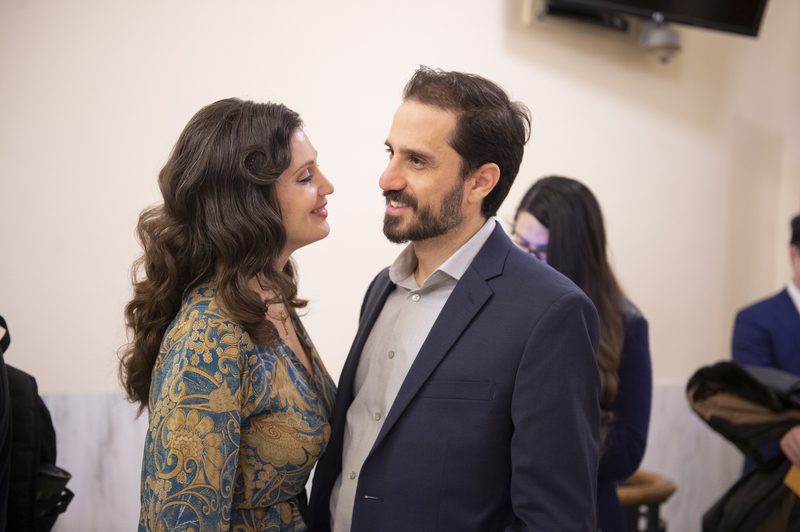 The day of the wedding can be stressful and it is no different at city hall. Though truthfully, there is less to go wrong because with a civil ceremony you avoid problems with setting up the reception, food issues and choosing the perfect wedding favors. We recently photographed a wedding a city hall where we are able to help both the bride and groom prepare for the ceremony. There were a few minor complications and we were there to help! The groom asked me while waiting to check in at the County Clerk if I thought his pants were too long. They did seem to be a bit long, but what could be done this close to their civil ceremony? I remembered back to how I used to “hem” my own pants temporily with tape and suggested that to the groom. After some discussion, I went into the Clerk’s office and asked one of my friends who works the front desk if we could borrow some tape. After some visual measurements and approval by the bride we managed to put a nice temporary hem on the pants and they looked great! As this was going on, I noticed the bride struggling with getting her eyelashes looking the way she wanted them, but there was nobody to hold the mirror for her because the Groom was busy “hemming” his pants. So without the bride asking me, I grabbed the mirror for her and held it while she did the finishing touches on her eyes. Just a simple gesture really and in no way heroic, but it was much appreciated by both of our clients. Bride and groom in front of city hall sign while twirling her dress. 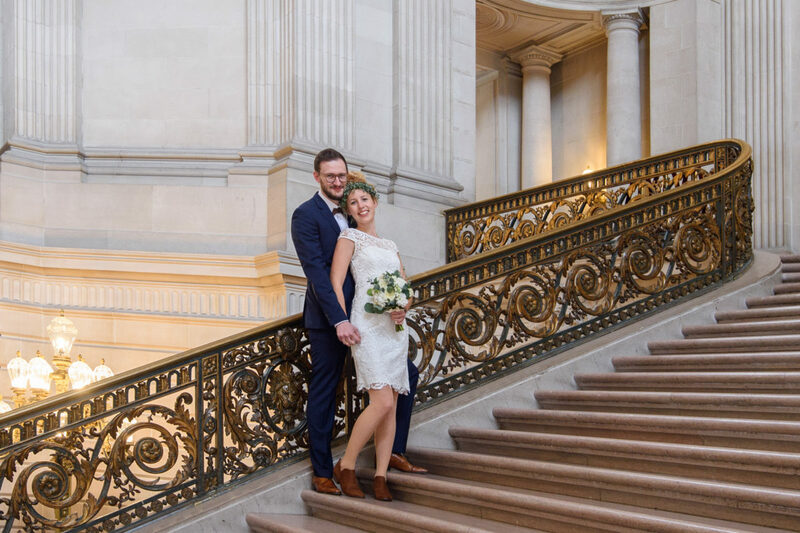 I never really gave it a second thought until a few weeks later I received a 5 star review from the newlyweds about their SF city hall wedding. One of the highlights of this Yelp review was the bride mentioning both of the problems above and how we helped. Again, these were relatively easy tasks, but it reminded me how important it is to be there for your city hall wedding photography client in all ways possible. Of course, we still needed to deliver great photos of their wedding, but the sometimes the little things get noticed and appreciated the most! Simple Way to Find the Right City Hall Wedding Photographer For YOU! I am sure you are thinking this is easy right? Just look at the photos on the Wedding Photographer’s website! Well, if it was that easy, brides wouldn’t spend hours searching for their ideal SF City Hall wedding photographer. I decided to write this post because of the things I have heard from the hundreds of brides (and grooms) I have interviewed over the past many years. Some negative and some positive. One of the biggest decisions engaged couples need to make is who should they choose to be their wedding photographer. This might even be more important when it comes to City Hall photographers. Why? Because there are so many photographers specializing in this type of wedding photography and it can be confusing. As I look at the different City Hall photographers, I see many of the same poses in the same locations. It is clear that everyone is copying each other in many cases. So how do you decide and how do you keep it simple? 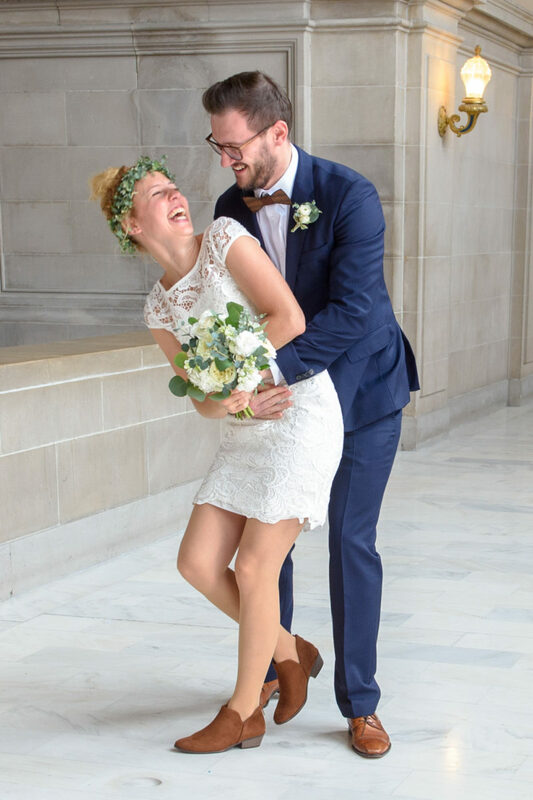 When you search for the perfect city hall wedding photographer for you, its important to not get caught up in websites that only show 1 or 2 of the best shots from each marriage. Yes, you are going to be attracted to this particular photographer because they are sure to display some amazing photos. While there is nothing wrong with that, it may not indicate how YOUR wedding images will ultimately look like. 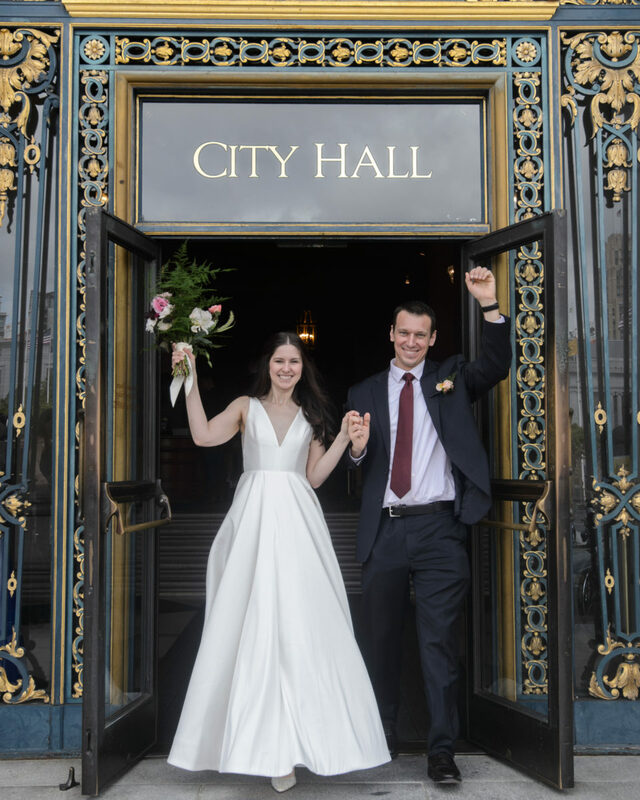 The fact is, when you take 300 photos at a typical city hall wedding you are bound to get a couple of amazing images. I am not saying it is only a matter of luck, certainly seeing images with impact is a prerequisite to exploring this particular photographer further. Once that initial attraction is over, you need to go deeper into the photographer’s website. The first thing you should look for is a complete gallery of ONE WEDDING! Hopefully the photographer will have a few to show off and with at least 20 photos each. 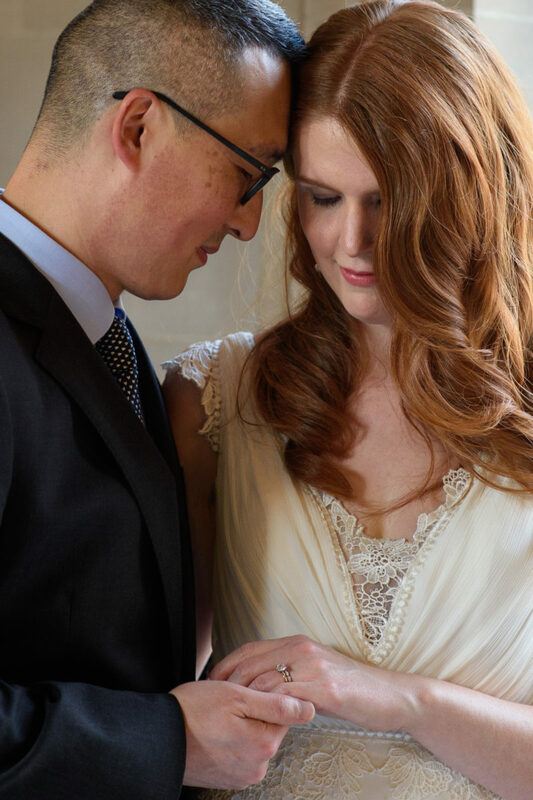 You want to see the entire coverage of this city hall wedding from start to finish. 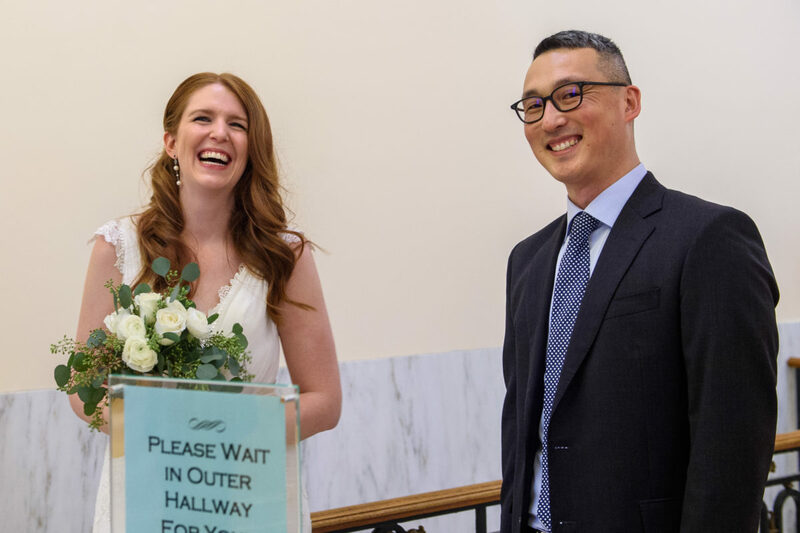 From candid shots showing the couple’s County Clerk Check-in all the way to the final shot when they say good bye in front of the San Francisco City Hall sign. There should be ceremony shots, posed shots, candids and even family pictures. Yes, what if you thought you hired the perfect wedding photographer only to find out they can’t put together a pleasant looking family photo for you. Backgrounds are important and so is the way the family is arranged and made to react to the photo. Now all that is left is to evaluate the quality of each of the photos and determine if it fits your own personal style. The Grand Staircase at Christmas time. A mix of black and white and color in San Francisco. After you have looked at websites and narrowed the field down to a select few, make some phone calls. Make sure you are talking on the phone to the wedding photographer and not a receptionist trained to deal with prospects. This part is very important, it will give you a sense of the city hall photographer’s personality and style. But most crucial is how they interact with you on the phone! If they start asking you questions about your wedding and the types of things you are looking for, this is a very good sign. It means that they care about pleasing you and not just looking for another sale. This is obviously your chance to ask questions as well, but it is very important that the conversation is 2-way and not just a canned marketing speech by the city hall photographer. Ask questions that will reveal their knowledge of the building and the whole process of getting married there. Come right out and ask them how many weddings they have photographed at San Francisco city hall and for how long. The answers to these questions will tell you a lot! Once you have interviewed a few city hall photographers and are satisfied with their responses and experience, it is time to do a background check. Yelp can be very helpful and other sites such as Wedding Wire and The Knot. However, here again, it’s important to reach deeper. The fact that your chosen wedding photographer has 60 – 5 star reviews is not as important as HOW they received these great reviews. Read the details of what some of the more recent reviews had to say. This will also help you learn about their style and how they deal with their clients. Keep it simple and straightforward and you will soon know that you found the right city hall wedding photographer for you! 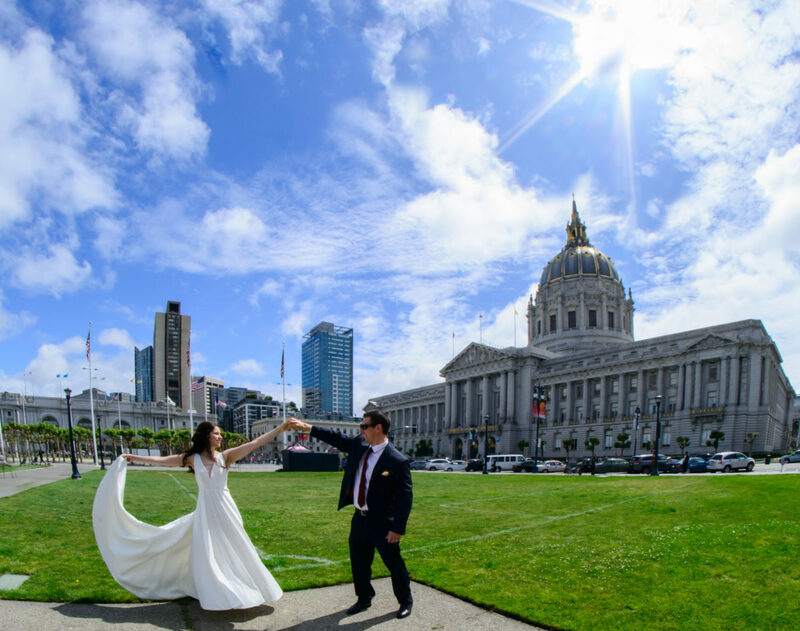 Author mike@cityhallphotos.comPosted on January 30, 2019 January 30, 2019 Categories City Hall, how to, PhotographyTags city hall weddings, find best city hall wedding photographers, find city hall photographers, guide to wedding photography, how to find a wedding photographer, how to guides, san francisco wedding photographer, search for wedding photographers, wedding photographer san francisco city hall, wedding photography stylesLeave a comment on Simple Way to Find the Right City Hall Wedding Photographer For YOU!